Welcome fellow quilters and those with similar interests!!! My name is Martha Penner (maiden name) Novacek. snuggle up with one on the couch on a chilly morning, or cold day. I enjoy making simple and fancy quilts and then admiring them as I use them. They become softer the more you use them. 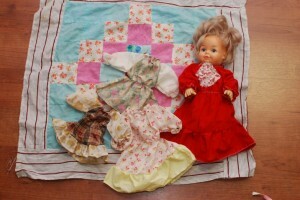 Doll quilt and clothes I made. weren’t too fancy, just functional. Sewing a doll quilt and doll dresses at a young age, my passion for quilts and beautiful fabric has blossomed. I also picked up embroidery and appliqué. blocks of embroidery work at around the age of 16. 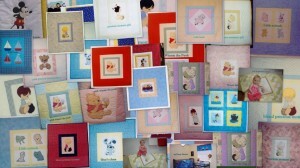 I have not always been very steady in making quilts throughout the years, but during the past 12 years I have made many baby quilts and bigger quilts. I’m glad I’ve been able to incorporate my passion for quilting into helping others with their unfinished quilt projects, heirloom quilt tops they inherited from their grandmother, and their desire for a beautiful quilt for themselves or as a special gift for someone close to them. I have an obsession with gathering lovely fabrics of all kinds of colors and designs. Of course it has to be on sale and a really good bargain as well. Therefore, when I see a good deal or great sale price, I have a hard time not getting some fabric. Of course over the past couple years I’ve been restraining myself, since my sewing room is so full of fabric. I do have at least three sisters out of four who enjoy quilting, as well as a seven year old niece itching to get started. So, even if I don’t get to use up half of my fabric in my lifetime, I know it will fall into hands that will appreciate it and love it as I do. Like I’ve said, my passion is quilts, fabrics, and quilting, anything involving quilts. I really enjoy seeing quilt tops or unfinished projects completed so they are ready to use, or put on display ready for all to admire. Since quilting is my hobby and now my business as well, I enjoy completing others’ lovely quilt projects. I am here to help you make a quilt yourself, and, or help you finish your quilt, or the quilt your “grandmother” left you. So, get that unfinished project out of that box, and have it completed so all can see it and admire it. So, you can wrap it around yourself to enjoy the comfort of it as you admire the lovely work you did, or someone close to you did many years before. About 80 year old all hand pieced quilt I hand quilted and finished. Get those lovely quilt tops your grandmother never finished out of storage, and let me finish them for you if you don’t feel confident enough to finish them yourself. Then you can spread them on your own bed or the bed in your guest bedroom, somewhere where it will be seen and admired by you and your family and friends. Learn How To Make a Quilt with my Video Quilting Instructions –A “watch and follow along” Stitch by Stitch, Beginners Quilt Making course – Create 3 Cute & Easy Quilts step by step (over 80 tutorials)! 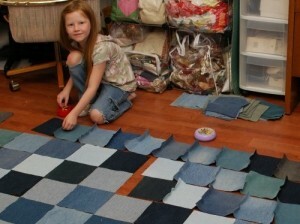 I have been trying to reach you to see if you can make a wedding quilt for my daughter who is getting married Nov 12, 2011. You made a beautiful quilt for my Mom’s 80th birthday….so I know your work is outstanding. Please let me know if you have time / interest in making this special gift for my daughter. I’m looking forward to making this quilt for your daughter. Congratulations on this special occasion! Hi Meryle, You just made my day with this comment! 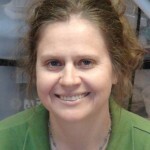 I’m so excited to hear you are enjoying quilting and that I can be of such help through my online classes. 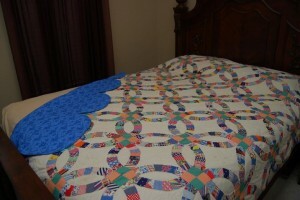 I would love to see pictures of the quilts you have made so far. If you don’t mind, I would like to post your testimonial to my website to encourage others to get started on this wonderful craft. I myself do more buttonhole stitch applique, but i have a fellow quilter who is very good at needle turn applique. I will try to get together with her sometime soon and see if i can video her. I will then let you know when I have that ready. I will let you know when I post it to the site. I’m looking forward to seeing where your style has led you in quilting. Yo can email me some pictures or post them to my Learn How To Make Quilts facebook page. Looking for a custom “Nursing” quilt for a retirement gift, is this something you can do or have done in the past that may have pictures. Hi….Help!!! I have a t-shirt quilt top that a friend pieced together for me, but needs some kind of backing….It is huge; probably as big, if not bigger than a king-sized bed. Can you help me? Yes, I can help. If you are local, let’s get together. I will email you and we can discuss how you want it finished and when we can get together. Dear Martha, You make the most beautiful quilts. Thank you for the mug quilts, bag and doll blanquet you sent for my daughter. She loved it all! I think the girls purse/bag is a great idea, girls love carrying their purses with their stuff. Your quilts are a work of love and a work of art, Iam completely inspired by you, and it is my goal to one day make a quilt with your instructions, Your website is really amazing and very easy to understand and to inspire others! Great work! I just happened upon your sewing website and blog while I was searching for ideas for my soon-to-be sewing space, which is very s-m-a-l-l. Not only have I gotten good ideas, but I have been re-inspired by not only your beautiful quilts, but your beautiful countenance. You are a lovely, inspirational person – and a fine example of His love and light shining through you. May you continue to inspire all of us, and may all of life’s richest blessings be yours. All the best to you and yours! Thank you so much Joyce. I’m still quilting some, but in the last couple months we have been so busy with remodeling a house we bought not too far from where we are now at my parents, that I have not had time to blog and keep up with my website. I am still posting and updating my https://www.facebook.com/pages/Learn-How-To-Make-Quilts/140245756034319?ref=hl facebook page, so you can keep up with me there for now and I have many more albums of pictures of quilts I’ve done there than on my website. I plan to add more to my website later. In a couple weeks, once we are moved into our new house, I plan to go crazy with making projects, like curtains, dinning chair seat cushions, and tons of other decorating sewing projects and I will keep posting on my facebook page. Thank you for your sweet and encouraging message and I wish all the best to you too and all the Lord’s dear blessings.